Before moving on to the Task Analysis, you might need to review the documents listed in this step. The review might be just a short one if you are trying to gain some contextual information with the tasks of a jobholder, or a lengthily process if you are updating or creating new jobs and/or tasks. Once you have completed your needs analysis, update any pertaining documents with new information you have gathered as they are essential to anyone involved in HRD, management, or performance as they set the standards for how a job is to be performed, which in turn, is used during the hiring process, promotions, pay, and solving individual performance problems. There are normally at least three documents directly related to learning and training projects: Job Lists, Job descriptions, and Task Inventories. A job list is a compilation of all job titles associated within the system. Jobs are collections of tasks and responsibilities. A job is generally associated with the worker's title. Secretary, welder, and bookkeeper are jobs. A job consists of responsibilities, duties, and tasks that are defined and can be accomplished, measured, and rated. It is used as an employment tool for classifying work and for selecting employees. A job description is then obtained by performing a job analysis. This is the process of breaking down the complexity of a person's job into logical parts. It identifies the knowledge, skills, and attitudes required to perform the job correctly. It is often concerned with the subjective elements of a job  the expectations and attitudes. When writing a Job Description, try to create a picture of the job that shows what will be expected of anyone fulfilling the position. Also, prepare a job description for each position, that is, you might have two or more sales positions, but some tasks may differ for each job. 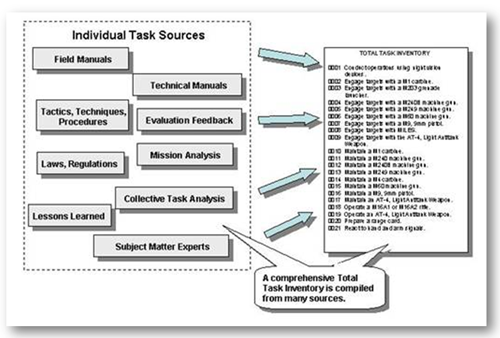 A Task Inventory is compiled for each job in a department or system. A task is a function the jobholder performs, such as typing a letter, spot welding a crack, or posting accounts into a ledger. A task is a well-defined unit of work. It stands by itself. It is a logical and necessary action in the performance of a job or duty. It has an identifiable start and end point and results in a measurable accomplishment or product. It takes Knowledge, Skills, and Attitudes (KSA) to perform a task. Some jobs may only have a couple of tasks associated with them, while others will have dozens of tasks. A task has a definite beginning and end. Tasks are performed in relatively short periods of time. They are usually measured in minutes or hours. Tasks are observable. By observing the performance of a jobholder, a definite determination can be made that the task has been performed. Each task is independent of other actions. Tasks are not dependent on components of a procedure. A task is performed by an individual for its own sake. A task statement is a statement of a highly specific action. It always has a verb and an object. It may have qualifiers, such as “measure distances with a tape measure.” A task statement should not be confused with an objective that has conditions and standards. The task inventory consists of all the tasks that a jobholder requires to perform the job to standards. Each task performed by the job incumbent must be listed on the task inventory. It provides vital information about the skills, knowledge, and abilities required to perform a job. This information is valuable for developing employee selection procedures and training programs. For hiring, it informs the selection committee and applicant of what the job entails. For training purposes, it tells the developer what the job requires. It is also valuable for setting standards in performance appraisals and evaluating jobs to determine the correct pay level. Again, this document may already have been created. You should ensure that it truly represents the tasks being performed by the jobholder and that all the tasks are listed. When writing the task, start each task with a verb, indicate how it is performed, and state the objective. For example, “Loads crates using a forklift.” One way of getting a comprehensive list is to have the employees prepare their own list, starting with the most important tasks. Then, compare these lists with yours. Finally, discuss any differences with the employees, and make changes where appropriate. This helps to ensure that you have accounted for all tasks and that they are accurate. It also gets the performers involved in the analysis activity. U.S. Army Field Artillery School (1984). A System Approach To Training. ST - 5K061FD92. U.S. Department of Defense Training Document (1975). Pamphlet 350-30. Updated September 21, 2015. Created July 13, 1995. Updated April 30, 2009.